Xi Jinping, declared that "China will never pursue its development at the cost of sacrificing interests of other countries... We will never give up our legitimate rights and will never sacrifice our national core interests. No country should presume that we will engage in trade involving our core interests or that we will swallow the bitter fruit of harming of sovereignty, security or development interests", at a Party Politburo Study session on 28 Jan 2013 . The statement is clear that it won't compromise on its territorial claims even though its claims, on historical grounds is dubious at the best. However, I believe that the lack of regional leadership is what helping China push its way through coercion. China aspires a bipolar world (at least for now) with US and itself as twin poles. China's booming economy is largely fuelling its aspiration. Its military expenditure grows accordingly. However, what is troubling to the countries in the region is its territorial claims. 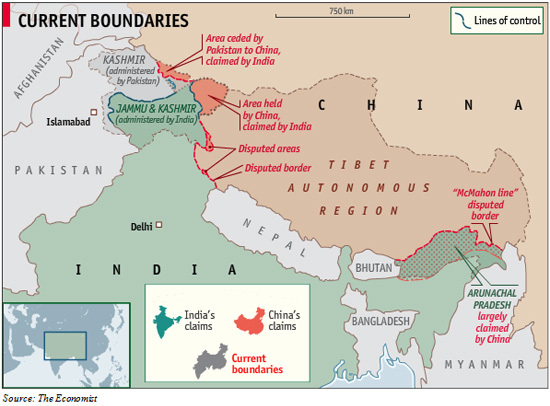 China claims almost the entire South China Sea and Arunachal Pradesh in India. 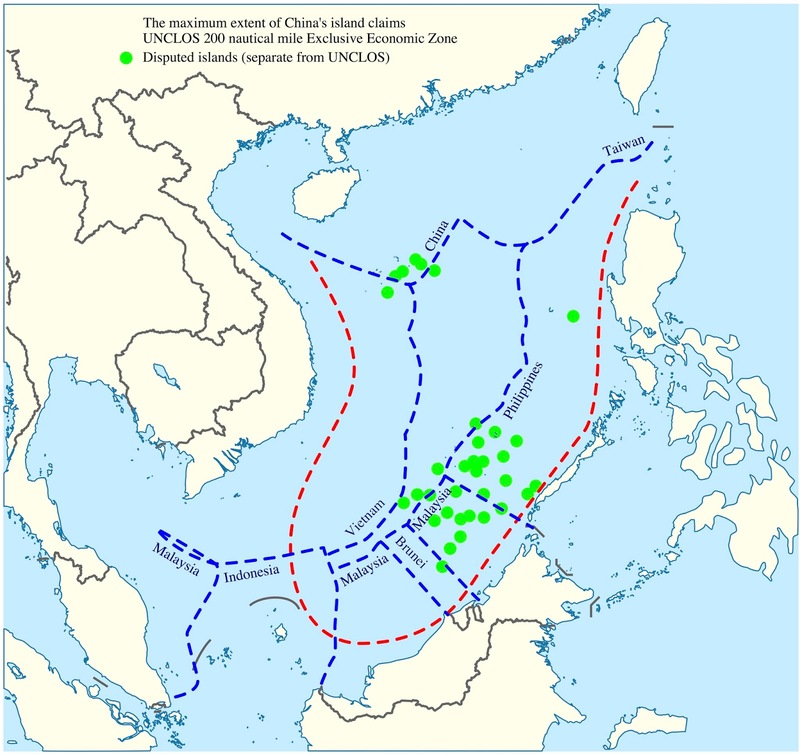 The claims of China on the South China sea intensified following its publication of huge potential oil reserves in the region. This area overlaps the Exclusive Economic Zones of Brunei, Indonesia, Malaysia, Philippines, Singapore, Taiwan and Vietnam. However, none of these countries could stand up to the military brinkmanship of China whose military expenditure ($131 billions) is more than thrice the total military expenditure of these countries put together. However, China also has disputes with Japan and claims the Senkaku islands of Japan as its own. US also comes into fray due to close association with Japan and interests in the region. Similar situation prevails in India's North East. After its occupation of Tibet, it claims Arunachal Pradesh as Southern Tibet. It claims the Twang region of the Arunachal Pradesh on the grounds that the Fourth Dalai Lama was born there. However, being a religious leader, Dalai Lama can be born anywhere. The claims are in contrast to its earlier agreement in 2005 that no populated regions would be exchanged. Further, to complicate the issue China avoids providing clarifications on Line of Actual Control (LAC). 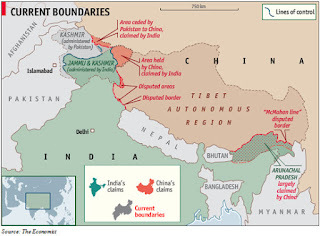 To complicate the situation Chinese army routinely enter into regions claimed by India as under its LAC. Though the CBMs and the established procedures had helped diffuse the situations from escalating into a full-fledged war, so far, it seems China is least interested to settle the dispute. It complicates the situation by implicitly accepting Pakistan Occupied Kashmir (PoK) as Pakistani territory by issuing visa while contending J&K and Arunachal Pradesh as disputed territories. Historically, it doesn't share a border with Pakistan but thanks to PoK and Askai Chin, it now does and by enforcing PoK as Pakistani territory it tries to pre-empt India from reclaiming its regions, in future. Whenever any of the countries, with which it has conflict with, tries to internationalize the situation or tries to build relations with a superior force, it adopts to coercive diplomacy, like in the case of Vietnam  and India . At the same time, it pushes economic ties that are in its favour, which by fuelling its economy is helping in building its military might leading to more coercion from China. Pre-empt any attempt by countries in the regions from forming a front. China is helping Pakistan to build its missile and nuclear capabilities, though it is against International norms. Pakistan has good network of terrorists in India and is a volatile country constantly engaging in exchange of fire and has already been in war with India multiple times. By making Pakistan Nuclear, China is has placed India's focus on countering Pakistan which is more likely to engage in war than China whose last war with India was in 1962. Further, in the name economic cooperation it is pushing a "string of pearls" strategy to engage and contain India within the region. As a part of the strategy, China is developing Gwadar port in Pakistan and Hambantota port in Sri Lanka. Both these countries are also caught in the debt trap set by China and could not refuse to China's intentions without heavy cost to the economies. In South China Sea region, China coerces countries that tries to internationalize the border dispute while pre-empting any attempts by the countries to form an alliance. It is forming artificial islands in the region to bolster its claims and to use them as backup airstrips to its carriers to pre-empt US from the region. China also feels that US is incapable of helping the region given its engagements in the Middle-East and its sagging economy. Nevertheless, it accepts US as a force to reckon with. China's tactic in the region is not just its military might. It uses economy as its second weapon. Pakistan, Sri Lanka and a host of other countries carry huge Chinese debt and have to follow Chinese suit in the matter. It now pushes its ambitious Silk Road policy, which India views with suspicion as the same infrastructure could be used to mobilize armed forces during conflict. As a matter of fact, I believe that China is slowly building infrastructure surrounding India in the name of co-operation with India's neighbours until an opportune moment. 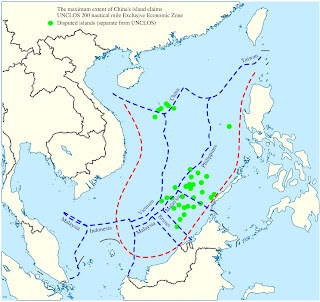 Similar situation prevails for the maritime route connecting countries in the South China sea as well. Further, by encouraging rogue states such as Pakistan and N. Korea to develop nuclear weapons, it adds a level of uncertainty in the region. In the likelihood of war with China, Pakistan will jump in to make the most of the situation. India, having focused for a very long time on Pakistan is incapable to fight war at two fronts. Similarly, it can use unpredictable N. Korea against Japan and US installations in the region. 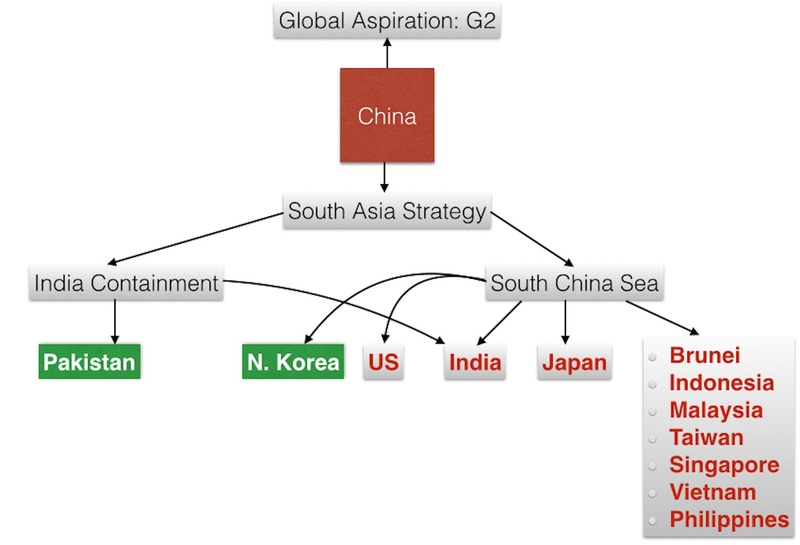 If all the countries in the region including Japan and Australia forms a economic-military block, then it would be possible to contain China's hegemonist attitude and brinkmanship in the region. Such an attempt requires commendable leadership and the ability to outmaneuver Chinese designs in the region. However, it seems, the South Asian region is devoid of such leadership which is what is letting China unchecked in the region to pursue its hegemonist attitude. Though US could not spread its resources thin across the globe, it could let countries like India, Japan and Australia and help them from behind. However, US is also highly dependent on China for its imports and China holds ~7% of US treasury bonds, which makes one doubt if US would be full committed to contain China in the region. Unlikely, as is evident from the very many one step forward two-step backward acts of US in the region. This is the South-Asian Conundrum Waiting for a solution. Boasting may not help repeating success!